Dian Fossey was a well-known American zoologist that was best known for her extensive study spanning 18 years of mountian gorillas in their natural rainforest habitat in Rwanda. She was encouraged by the famous anthropologist Louis Leakey. She established the Karisoke Research Center in the Volcanoes National Park, Rwanda which continues to study and protect mountain gorillas today. Her 1983 autobiography Gorillas in the Mist became a best seller. She was one of the foremost primatologists of her time being one of the three “Leakey’s Angels”, which also included Jane Goodall and Biruté Galdikas. Fossey’s recearch focused on gorillas, Goodall studied chimpanzees, and Biruté specialized in orangutans. Dian Fossey was born in January 16, 1932 in San Francisco California, where she grew up with her mom, Kathryn Kidd and her step-dad, businessman Richard Price. She developed a love for animals at a very young age. Throughout her young life, she was a great horse-woman and dreamed of one day becoming a veterinarian. 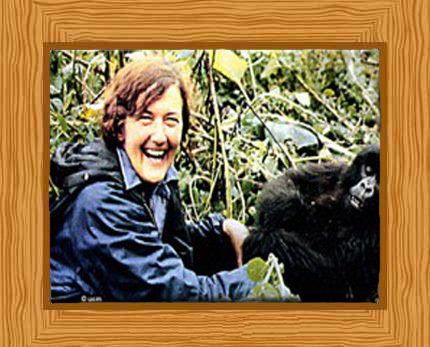 She was educated at Lowell High School and at the age of 19 Fossey enrolled in the University of California to study pre-veterinary medicine courses. While she was a very good student, base science subjects like chemistry and physics did not inspire her. Fossey later moved to San Diego state where she majored in occupational therapy instead. After she graduated from her occupational therapy course in 1953, Fossey spent several months as a hospital intern in California. In 1955, she moved to Louisville in Kentucky where she served as director of the occupational therapy department at the Kosair Crippled Children’s hospital. Fossey lived on a farm on the outskirts of the city and there she spent a lot of her free time tending to farm animals. Fossey eventually became restless and yearned to see what the world had to offer and so she set her sights on visiting Africa. In September 1963, Fossey finally made her way to Africa. She had spent her entire life-savings for a seven week trip and had even taken out an $8,000 bank loan which was sizeable at that time. She visited Kenya, Zimbabwe, Tanzania, and the Congo. She met up with Mary Leakey and her husband Louis Leakey- they were both archaeologists and one of the most famous husband-and-wide teams in scientific history. She also encountered wildlife photographers Joan and Alan Root who were busy with a documentary on gorillas in Africa. They brought her along on one of their trips to look for the gorillas and Fossey fell in love with the great apes. Fossey returned to Kentucky with great reluctance and three years later, in 1966 she met up with Louis Leakey again. He suggested, that just like Jane Goodall studying chimpanzees in Tanzania, she too could undertake a long-term study-her project being the gorillas in Rwanda. Fossey was delighted with this proposition and studied Swahili and learnt how to study primatology in preparation for her research. She had to wait the eight months it would take for her funding and her visa to be ready. In December 1966, she finally arrived at Nairobi, Kenya. She soon acquired a Land River she named “Lily” and took a trip to the Gombe Stream Research Center to meet up with Jane Goodall to learn first-hand how Goodall interacted with her chimpanzee subjects. Initially, she studied gorillas in the Virunga Mountains in the Democratic Republic of Congo for six months and photographer Alan Root taught her how to track gorillas. Later on that year she moved location and established the Karisoke Research Center in the Volcanoes National Park, Rwanda in September 1967. The Karisoke Research Center was a rather remote camp nestled in the rainforest found in the mountainous Ruhengeri province of Rwanda. It took time for her to get to know the mountain gorillas in this new area because they had never been studied before and were wary of people. Not only did she have to contend with the remote location but she also had to deal with research students that often left because they could not cope with the extreme coldness and darkness of the camp. To gain further qualifications, Fossey also enrolled in the department of animal behavior at Darwin College, Cambridge, in 1970. She traveled between Cambridge and Africa until 1974, when she received her Doctorate. Fossey was vehemently opposed to poaching and while it was an outlawed activity in Rwanda, it was a law that was interpreted very loosely. Not only did she work to prevent the poaching of gorillas but she also cared for injured and sick primates should they come to her attention. She was also against the idea of tourists coming to see the primates since they were susceptible to human diseases. These days, her foundation acknowledges responsible tourism and even promotes it as a good way to help the preservation of her beloved gorillas. Fossey was very attached to one particular male gorilla called Digit. She first encountered him in 1967 when he was about five years old. Tragically he was stabbed and killed by poachers in 1977 while trying to defend his group. Fossey used his death to raise more awareness about the mountain gorillas and to raise funds for anti-poaching patrols. Dian Fossey was found hacked to death in her cabin on December 1985 and it is believed that poachers were the culprits. Fossey is buried at Karisoke in the gorilla graveyard next to Digit. Her 1983 autobiography Gorillas in the Mist became a best seller and was later turned into a movie of the same name in 1988. Her foundation lives on and has even extended operations to help gorillas in other African countries.